I get several cooking magazines~ subscribe to a few, sometimes can't put one down at Barnes and Noble so I buy it, others I think are going to be good judging by the cover and end up disappointing. BUT there is one magazine, by far my favorite of the year, it comes out once a year, and I've bought it for the past 5 years. Except for last year when I don't think they released one. Every single recipe I've made has been fabulous. Want to know what it is?! 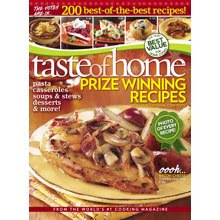 YES - Prize winning recipes! Every single recipe fabulous in it's own way. It was a happy happy day yesterday when I found it for sale at the Home Depot. Even better, I was so excited to find a soups/stews and light baking categories! Hubby just happens to be sick so I made the top prize winning soup which was awesome!! Once again life has happened and I missed a few days of the P90X. I am not by any means giving up - I got on the scale this morning and was down 8 pounds total so far for the year! It's hard to give up when you're seeing results. This afternoon I will be back at it again, today is chest/back/ab day - hello boys and girls can you say one million push ups? I also happened upon some old high school pictures which is also a great motivator. ** It just so happens I had the willpower of an athlete back in the day. I remember my weight had to be 125. If it started to creep to 130, I got my booty on that bike and spun till that 5 lbs was gone. When I was eating, I would eat not to get full but just to no longer be hungry. I had a motto that I had found in a magazine - "Immediate gratification is for babies." Where did I get that willpower and where has it gone?? Alright well. If I did it once for sure I can do it again. I don't know if you can read it but it says "BLOGGING - Never before have so many people with so little to say said so much to so few."